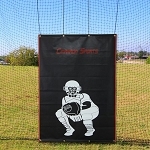 Discount Batting Cage Kits • Fittings & Net Included • Free Shipping! If a longer lasting steel cage is not in your budget and a fiberglass batting cage is what you want, by all means order one of the Heater Sports complete batting cages. Although nothing is more simple than ordering a complete batting cage package, when you want a steel batting cage, they can get cost-prohibitive. The main reason - those steel frame supports are heavy and the cost of shipping them, alone, adds $500-$700 to the price of the batting cage. And, of course, the manufacturer needs to make a little extra money on each one of those poles, so the real cost to you is more like $700-$900 more than if you ordered a batting cage kit and picked the poles up, yourself. 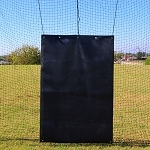 Below, you can view the discount batting cage kits that we currently provide. All of our batting cage kits ship for free and include at least a one year warranty (some are two years). Most even come with a 31 day money back guarantee. Below the products, be sure to check out more reasons why people order batting cage kits instead of full batting cages. 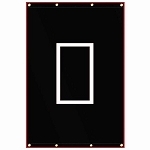 Folks who want a steel batting cage are usually far better off ordering a batting cage kit. Batting cage kits include the fittings, hangers and, of course, the netting. The only thing they don't include is all of the support poles, which are available at any major hardware superstore like Home Depot or Lowes for less money than the manufacturers charge for those poles. If you don't have a truck or van to transport the steel conduit poles home, it's still FAR less expensive to rent a truck or have them delivered by Home Depot or Lowes. The average price is about $11.00 a piece. If you have any questions about whether to buy a kit, full batting cage package or just aren't sure what you really need, please don't hesitate to call us. We are happy to help people choose exactly what they need!